Yale researchers have demonstrated silicon-based nano-cantilevers, smaller than the wavelength of light, that operate on photonic principles eliminating the need for electric transducers and expensive laser setups. The work, reported in Nature Nanotechnology, should usher in a new generation of tools for ultra-sensitive measurements at the atomic level. In nanoelectromechanical systems, cantilevers are the most fundamental mechanical sensors. These tiny structures – fixed at one end and free at the other – act like nano-scale diving boards that “bend” when molecules “jump” on them and register a change that can be measured and calibrated. The new work shows how these structures can be improved by using integrated photonics to sense the cantilever motion. Tang’s paper also details the construction of a sensor multiplex – a parallel array of 10 nano-cantilevers integrated on a single photonic wire. Each cantilever is a different length, like a key on a xylophone, so when one is displaced it registers its own distinctive “note.” “A multiplex format lets us make more complex measurements of patterns simultaneously – like a tune with chords instead of single notes,” said co-researcher Mo Li. At the heart of this breakthrough is the novel way Tang’s group “wired” the sensors with light. Their technique is not limited by the bandwidth constraints of electrical methods or the diffraction limits of light sources. 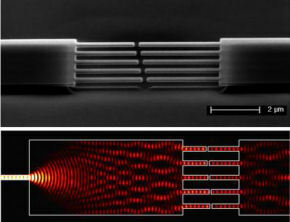 “We don’t need a laser to operate these devices,” noted Wolfram Pernice, a co-author of the group’s researcher paper. “Very cheap LEDs will suffice.” Futhermore, the LED light sources – like the million LED pixels that make up a laptop computer screen – can be scaled in size to integrate into a nanophotonic-chip – an important feature for this application. “This development points to a future of compact, robust and scalable systems with high sensitivity that will find a wide range of future applications – from chemical and biological sensing to optical signal processing,” said Tang.